Sébastien Loeb Racing : Two doubles and a podium! 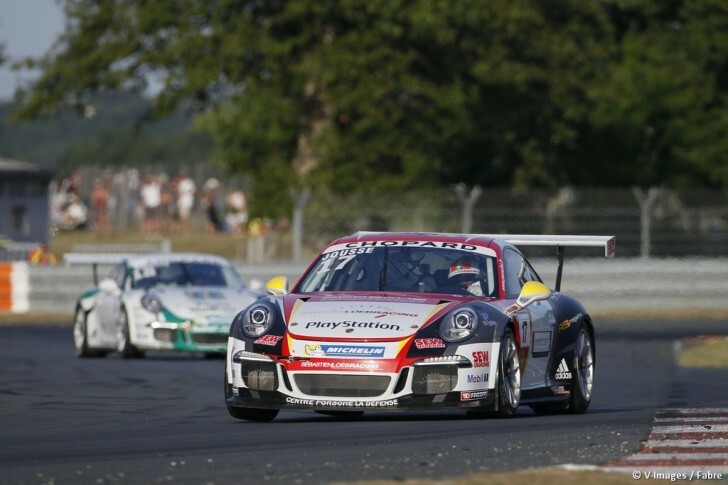 Before the Porsche Carrera Cup France’s Summer break, the Sébastien Loeb Racing spent the weekend (July 4th-5th) on the Val de Vienne track, where their four drivers attacked to clinch some titles. No win to celebrate for the Dominique Heintz and Sébastien Loeb’s team, but an important podium for Maxime Jousse who now more than ever can have good hopes for a title at the end of the season. Christophe Lapierre and Roar Lindland are also striving after that crown. They share the laurels after having monopolized both pole positions in B-class. As for Joffrey de Narda, he completed some solid performances. Alas, a mechanical problem at the start of the first race, plus a contact caused by another contender in the second race, stopped dead all his hopes. As he had announced, Joffrey de Narda paid full attention to the qualifying and reached the third position on the starting grid of the first round. As for Maxime Jousse, he stood in third row while Christophe Lapierre and Roar Lindland achieved an excellent double in B-class. That result got confirmed 35 minutes into the race. At the start, Christophe had to give in facing a contender from the B championship, but the driver from Montélimar then attacked four laps before the chequered flag and managed to take leadership of the race, a first position he kept all the way to the finish line, 1”8 seconds ahead of his Norwegian teammate. Unfortunately, Joffrey’s excellent practice sessions could not pay off as, right from the moment the lights turned off, a faulty clutch, following on an unusually long starting procedure, prevented him from going any further. With a terrific start, Maxime made the Sébastien Loeb Racing shine and was already in third position after the first turn. Despite putting pressure for half an hour on the second, what remained most important was to score some big points and to be in front of his rivals, which he did by securing the third step of the podium. Joffrey de Narda confirmed his fantastic performance in the qualifying by starting once again from the third place, just in front of Maxime Jousse’s bonnet in the third row. A new hit in B-class with a second double back to back posted by Roar Lindland and Christophe Lapierre, in that order. Delicate conditions on Sunday, the track was still wet after a morning thunderstorm. Nevertheless the contenders took to the track with slick tyres. Traffic at the start forced De Narda to let go of a place, as opposed to Jousse who reached the 7th position after the first lap. Lap after lap, while Joffrey was forced to join the list of withdrawals, after having been hit by another car, the driver from Le Var moved up in the hierarchy and crossed the finish line just off the podium, scoring some great points which allow him to stick together with the leading pack in the championship. In B-class, Lindland and Lapierre got stuck behind a contender who was struggling, but methodically prepared their return in the lead which took place during the 7th lap as they took control of the race. The Norwegian driver thus secured a first success in class this season and stayed closed to Lapierre who is still comfortably settled in the leading spot.